This year Marcellus Hall and I attended the Society of Illustrator 51 st Book and Editorial show. Last year his work for Because You Are My Baby was selected into the show. This year it was for City I Love. A book of poems that guide the reader on an international tour—from New York to San Francisco, London to Tokyo, and beyond. The poems follow a dog and his bird friend on there travels. By developing a character based poem book we hoped to bring poems more in to the Trade market. Fingers crossed. Marcellus is currently finishing up the sequel to Because You Are My Baby titled Because You Are My Daddy. I allowed him to take a short break to enjoy the nights festivities. Lee Bennett Hopkins has written and edited numerous celebrated poetry collections, including Behind the Museum Door, My America, and Home to Me. He lives in Cape Coral, Florida. 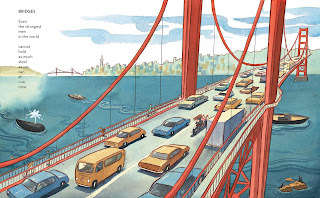 Marcellus Hall has created artwork for many magazines, including the New Yorker and Time. He is also the illustrator of Because You Are My Baby. City I Love is his second book for children. Raised in Minneapolis, he now lives in New York City. 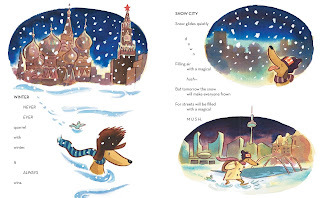 A Canuck dog traveling through Russia and what looks like either TO or Seattle, cool, will look for this book! Great blog! I'm a fan of Marcellus Hall. I really admire the way he depicts urban life. Just off to the right of my monitor hangs one of his block prints he gave to my wife in 2004. Actually it was made by carving 3 erasers that he joined together. Brilliant! Here is a link to the book CITY I LOVE. Even though I worked on it I am a Big fan of it. Robert love your work! Do you have a website?